Time for another ride up in the Sierras. I decided to do something a little bit different this time, although that seems to be a goal for most rides that I go on. This time my goal was to get to the top of Sierra Buttes, to the lookout on the top of the mountain, where you get a very nice view. I've been as close as you can get on the pavement, with my wife and Son last year, driving my Mustang convertible. I figured with an adventure bike I could get much closer and then just hike the rest of the way. But I didn't want to go the easy way, I picked out dirt roads coming in from the south, rather than the easier paved road coming in from the north. The starting point for the dirt roads is about 100 miles from here. This time I decided to get a much earlier start than for my last trip. I was aiming for 6:30 a.m., which meant that I was walking out the door about 7:00. The first time. I had to go back in for something and finally hit the road about 7:05. Normally when heading into the hills anywhere north of here, I take Salmon Falls Road and Highway 49, two interesting twisty roads. This time, since I knew I would be riding a couple of hundred miles there and back, I decided to do an easier road. 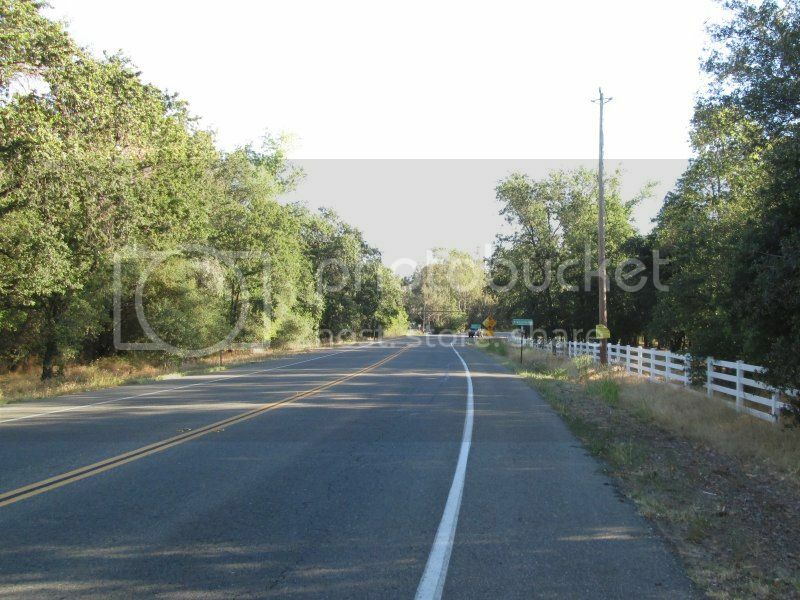 Folsom-Auburn Road goes around the west side of Folsom Lake and all the way to Auburn. Most of it feels like it's in the country, although it's a regular commuter road on weekdays. Nearly all of it is two lanes winding through the countryside, but without any real sharp turns, but no long straight sections either. Sometimes I enjoy riding roads like that at a relaxed pace. I quite like Highway 49 for most of its 300+ miles, but the 24 mile section between Auburn and Nevada City is a straight commuter road that I don't enjoy at all. Someone on another forum had mentioned that you could head east a little ways, then get on Placer Hills Rd and Dog Bar Rd. I found those roads much more enjoyable, even though it involved six miles of freeway riding. 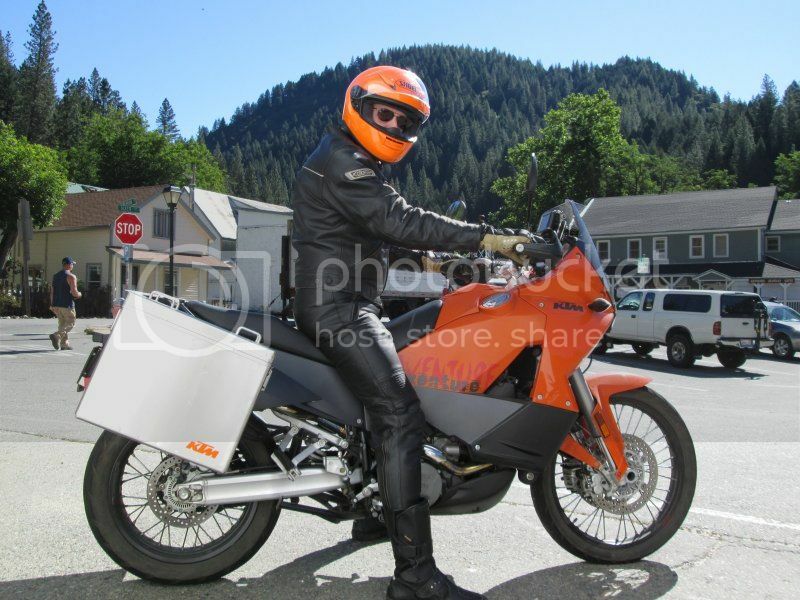 Speaking of freeway riding, I had a great example of why I like riding more powerful bikes. Those who claim a Ninja 300 or other lower powered bikes are good enough would have had a tough time with the freeway merge. Here it is on Google Maps for reference: http://goo.gl/maps/JBDHS The blue line does not come close to showing this particular merge. You go down a fairly steep hill, make a really sharp turn at the bottom which can't be taken faster than about 10 mph, then have a short merge into 65 mph freeway traffic heading uphill. As soon as I got around the turn into the merge lane and could see what traffic was coming, a semi truck was right at the worst spot for me to be able to get in front of it without some serious power and getting in behind it would involve still going quite a bit slower than the other traffic. Fortunately the 999cc engine of my KTM was up to the task and I was soon in front of the truck and pulling away, before the end of the merge lane. Another advantage to a bigger, more powerful bike comes at the end of the day when heading home. I took the same 18 mile route coming into Folsom on Salmon Falls Rd as two weeks ago, and it's quite a bit less work on the more powerful KTM than on the less powerful XR650L. In a bit I'll explain some major disadvantages to the bigger bike, though. Placer Hills Road is like this for most of its length. 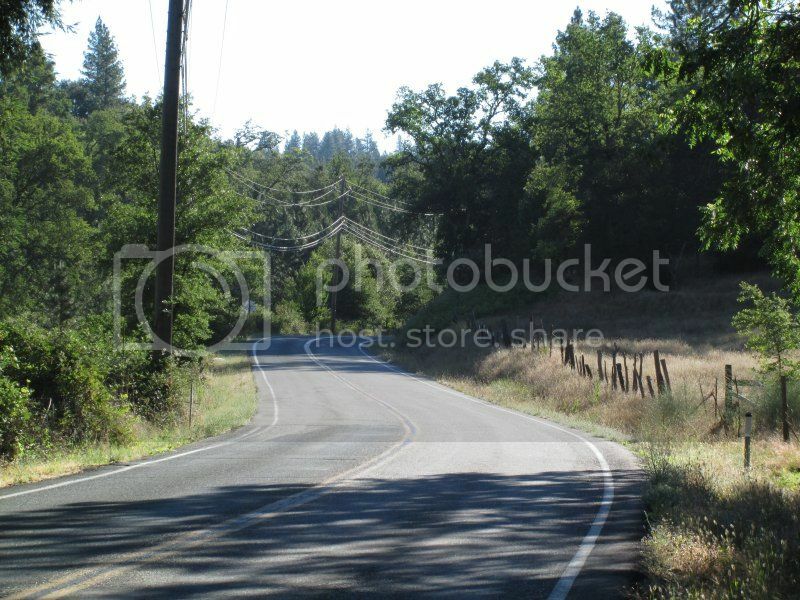 A nice road winding through the country side. I have no idea how Dog Bar Rd got its name, but the first part of it is tight and narrow. Here I'm heading into a rather narrow section after crossing a canal. Many of the rivers in the Sierras still have a bit of gold in them. 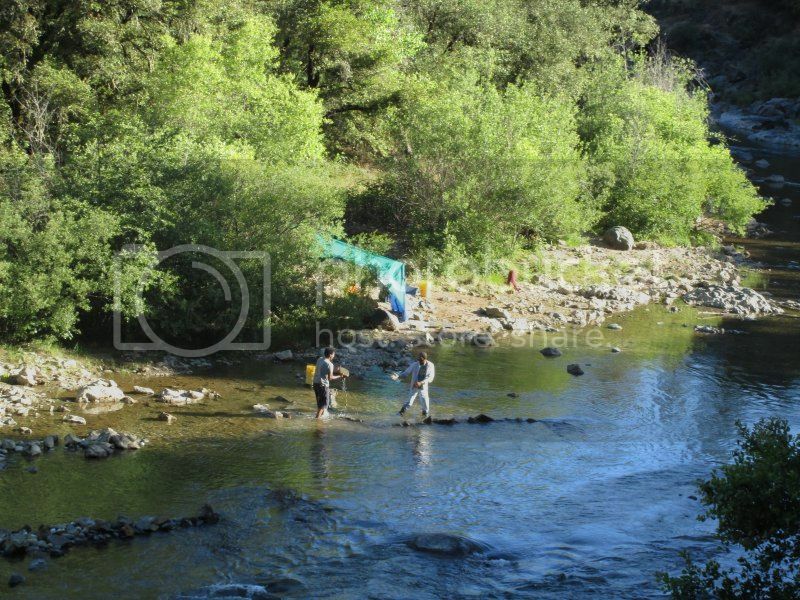 I think these guys were trying to dig some of it out of this river. Those two roads come out in Grass Valley and there was about six more miles of freeway to Nevada City before Highway 49 splits off and turns into a wonderful road for many miles. Just after Highway 49 turns off, there is another road north - Bloomfield Road - which may or may not be dirt for a significant portion of its 36 miles. 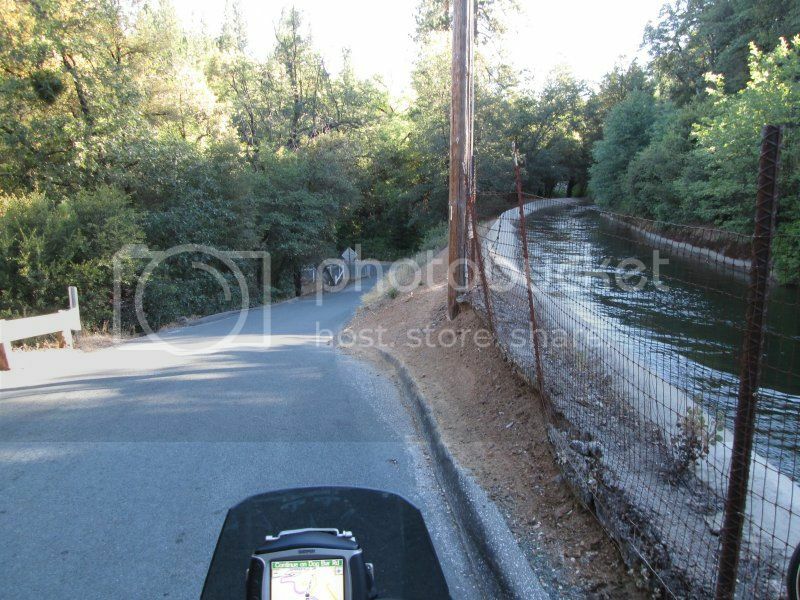 I was tempted to try it out, and went up it about a quarter of a mile, but didn't want to take a chance of being all worn out before I even got to the destination of this ride, which was a couple of dirt roads between Downieville and Sierra City that head up to the top of the mountain. 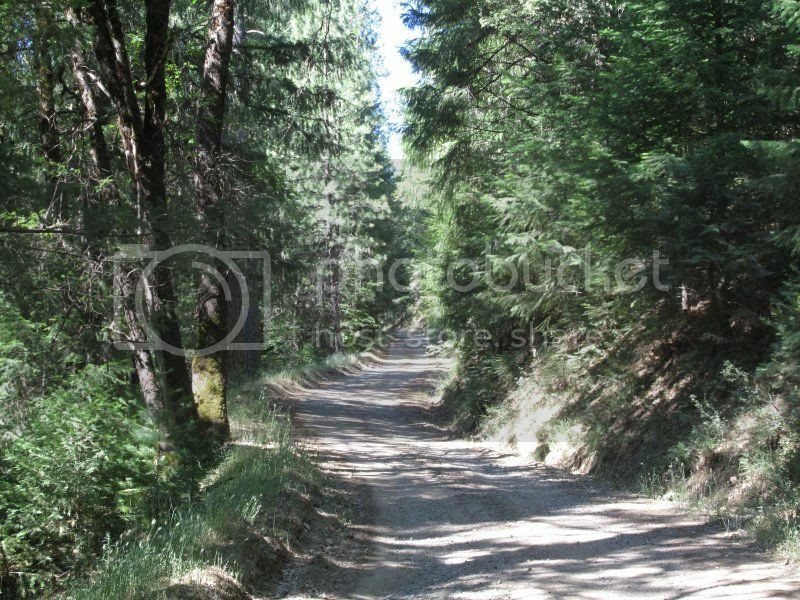 About 10 of the 42 miles of Highway 49 between Nevada City and Downieville had recently had shoulder work, and there was dirt and gravel spread across much of the road. It wasn't terrible, and would hardly be noticed in a car, but was enough that I couldn't trust traction through that section. That mainly meant that I rode in the left tire track for most of that part. It also meant going just a little bit slower though the corners. I had one thing happen along there that had never happened before. Quite a few people haul boats to some lake up there somewhere (maybe New Bullards Bar Reservoir?) and I got behind several of them. When I was behind one boat, I smelled something that didn't smell like diesel exhaust and I couldn't place it at first. Then when the sun was in front of me I could see droplets of some liquid coming off of the left side of the boat. I quickly figured out that it was fuel, so I moved over to the right until I had a chance to get past the boat. I have no idea why fuel would be coming out of the top edge of a boat like that. 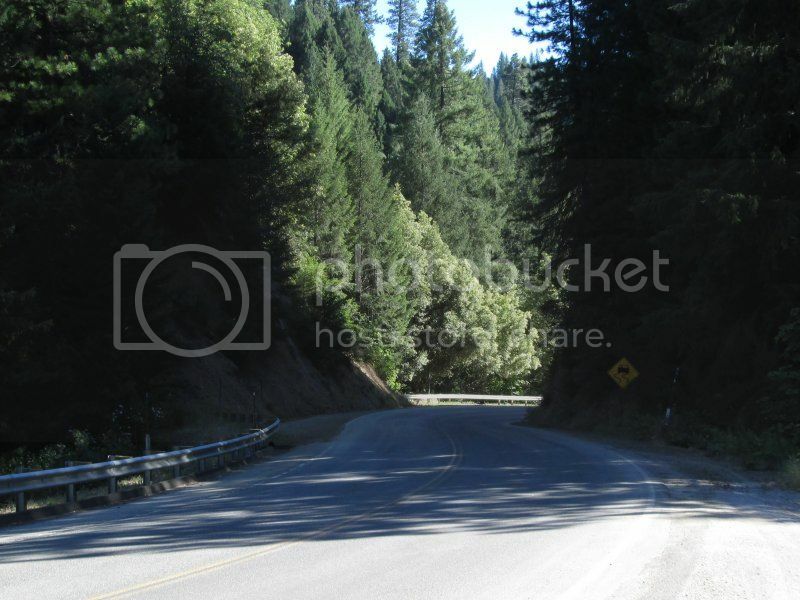 As you approach Downieville, the speed limit keeps dropping and dropping until it gets down to 25 mph. I had only planned to stop there long enough to use the restroom. As I was about to leave, I spotted a guy getting ready to mount a beautiful Ducati Multistrada Pike Peak Edition, so I went over to talk to him for a bit. He was out riding with his wife and said that the bike was just about perfect for the two of them. I was envious. As I was about to leave I realized that I was overdue to refill my fuel tank and did not want to head up a potentially long dirt road and run out of gas. 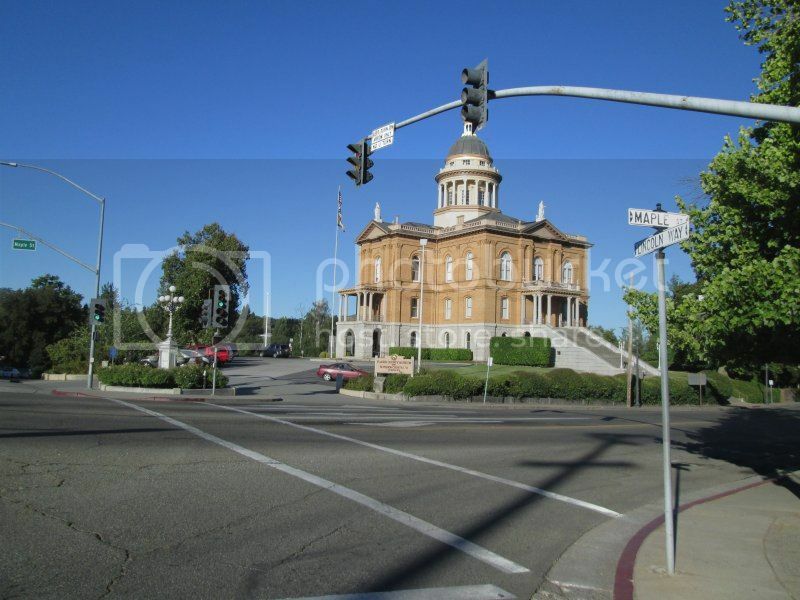 I tried the setting on my Garmin to find fuel and it indicated the closest station was 12 miles away in Sierra City. I couldn't remember seeing a gas station in Downieville, but then I looked around a bit and noticed a sign saying Gas, Groceries, Snacks just on the other side of the parking lot. They only have one pump and it's more expensive than in the more populated areas, but I was happy to fill up there. Once full, the guy on the Ducati hadn't left yet, so I had him snap this photo of me with the bike. Notice that I'm dressed for the 200 miles of road on this trip rather than the lesser numbers of dirt miles. For some reason, the road felt much easier to ride than the one two weeks ago off of Foresthill Road. I think more dirt and less gravel makes them easier. 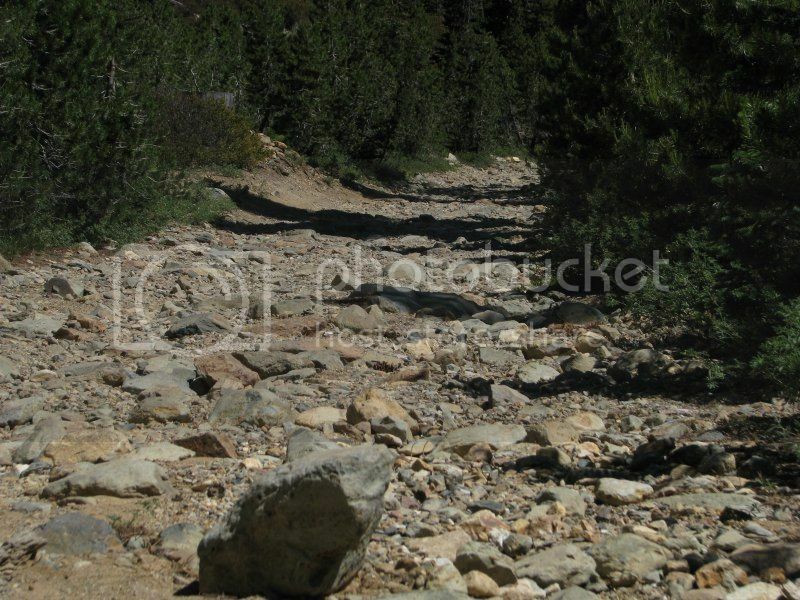 Ultimately I got the full combination of dirt, gravel and rocks before I came back down out of the hills. There were some great views at some spots along the road. I make my GPS routes using Google Maps, then run a program to convert it to GPX format. At one point, the route in my Garmin from Google Maps was a little different from the road it showed in its own map, and I was in between both, but not on either. Google Maps isn't too accurate for dirt roads up in the hills, and it's especially hard to tell a minor paved road from a dirt road from a trail from something that doesn't even exist. When riding a motorcycle using a GPS, I don't spend too much time staring at it, I look at it when intersections come up and I might need to turn, or occasionally to verify that I'm on track. I was following the main dirt road up in the hills and pretty soon nothing at all was showing on the GPS screen. I missed the point where the road went somewhere different from what I had planned to take. The GPS keeps track of where I've been with a blue line, so I can always find my way back, so I kept going. 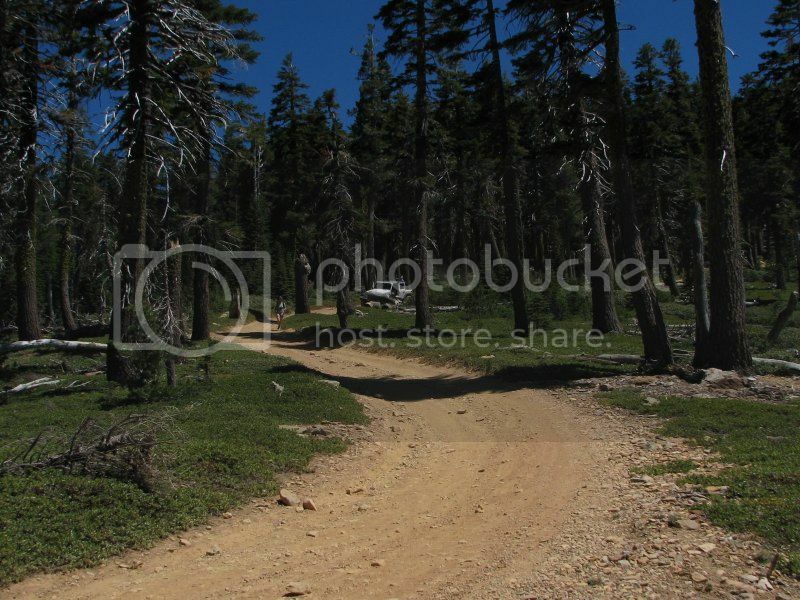 As is common on dirt roads in the Sierras that only go to camping spots, the road often continues to get rougher and narrower the further you go. That's a hint that you'll probably be coming back out the way you went in. I was sort of hoping I wouldn't have to come back down this rough, rocky trail. When riding a heavier bike on rough stuff, you have to plan further ahead to miss the big rocks, because they're not as nimble as lighter bikes. There were a couple of times when I thought I might get pitched off into the bushes after not missing a big loose rock. Eventually the road got tighter and narrower until I came to a sign prohibiting anything but bicycles and hikers from going further. There was one guy there with a bicycle, but soon I was joined by many more. It seems that a woman was lost up there somewhere and they were involved in the search and rescue. 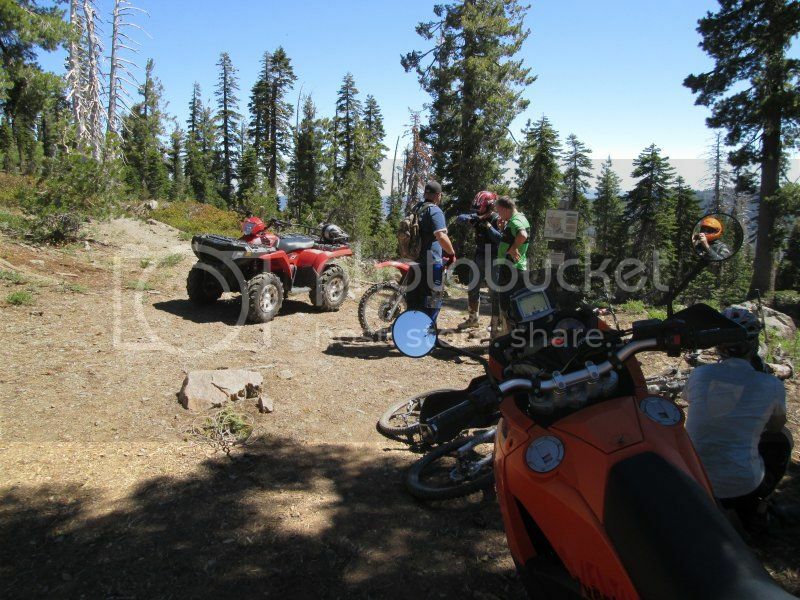 Pretty soon a (much) smaller motorcycle and a quad came up the "off limits" trail as well. They relax the rules for the trails during search and rescue operations. I wear earplugs when riding to save what's left of my hearing from the wind noise. I usually take one or both of them out when talking to people. One for short stops, both otherwise. After talking a bit with the bicyclists at the end of the dirt road, I decided to leave them out until I got back to pavement, since I was unlikely to get going much faster than 25 mph, so wind noise wouldn't be an issue. I didn't realize how much banging and clanking the bike makes when bouncing over rock fields. Part of it was the side case lid that I had to tie on, because the new one hasn't arrived from Touratech yet. Nothing sounded like it was being damaged, so I tuned out the bike noises. I followed the GPS blue line back out until I came to what looked like a promising road. The first one didn't go anywhere that would get me out, so I tried another. That one was good and took me to a paved road that I was pretty sure was the one that I wanted. I felt that I had had enough dirt road exploring at that point. Once I got to the staging area for the bicycles that ride down the hills, I was at a familiar place. I had been there once before. Now the only thing I still needed to do was head for the Sierra Buttes Lookout and see if I could get to the top of the mountain. The road headed to the lookout was easy dirt and gravel for a few miles, then started to get steep heading up the hill. At one point where it was quite steep and loose, I stopped to get a closer look at what I might be getting myself into. 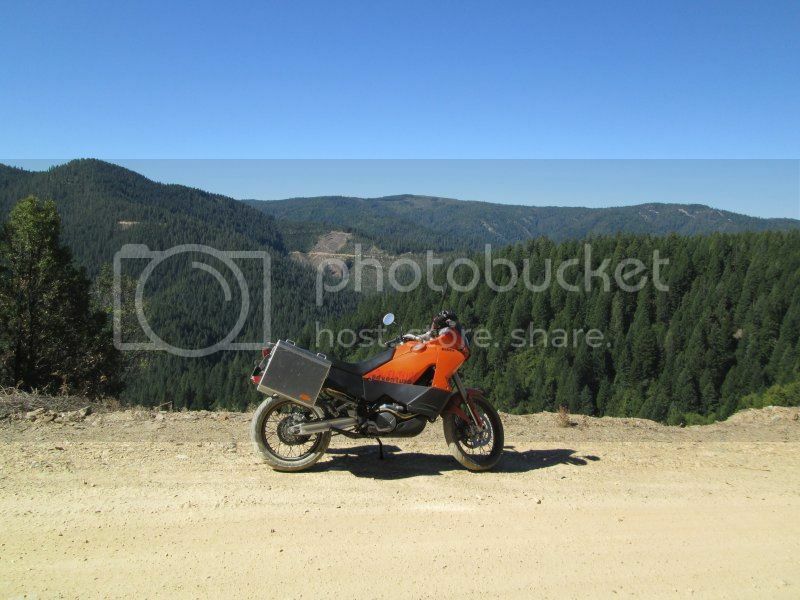 If I had been on my XR650L, I would have continued right on up, but I felt that the chances of me making it through on the big KTM were only about 80%, and I didn't like the 20% odds of trying to deal with nearly 500 pounds of Adventure bike tipped upside down on a steep dirt road. I decided to park at the side and hike up from there. This is where I stopped the bike. It was still pointed uphill when stopped there (front tire probably 8" above the rear) and I was a bit higher on the steeper part where I took this photo. I moved it a bit more to the side so Jeeps and trucks would be able to get by and started hiking up the hill. After what felt like about half a mile, I saw a Jeep coming down following a woman who was running down the road. I asked her how much further to the top, and when she said "it's only about a mile and a half", I knew that I didn't have enough energy to hike to the top at that altitude. I talked them into giving me a ride back to where I had left the bike and got to sit in the back of the jeep with three cute kids who were totally enjoying the trip. From there, it was only a little bit of a bother to get the bike pointed downhill again, and I was headed out. 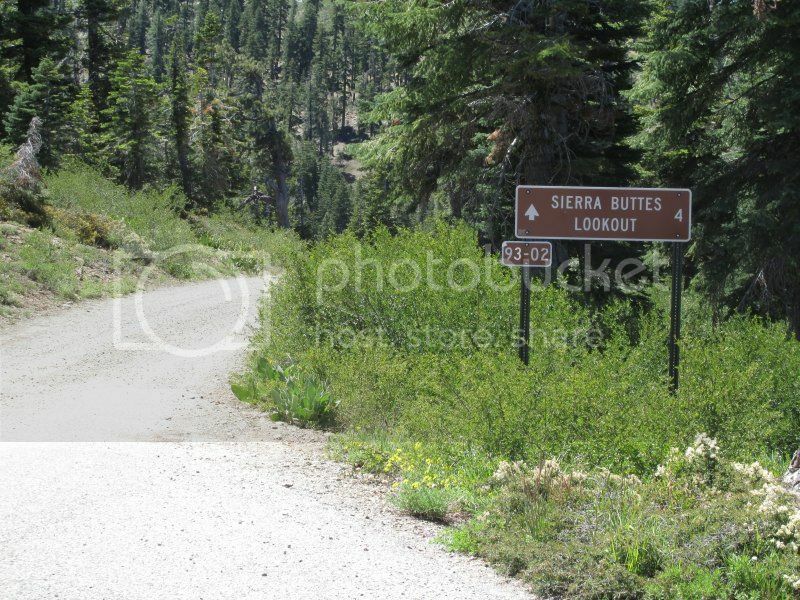 I had originally planned to take a dirt road down to Sierra City, but at this point I opted for the easy way out, which was all paved once I got back to the bicycle staging area. 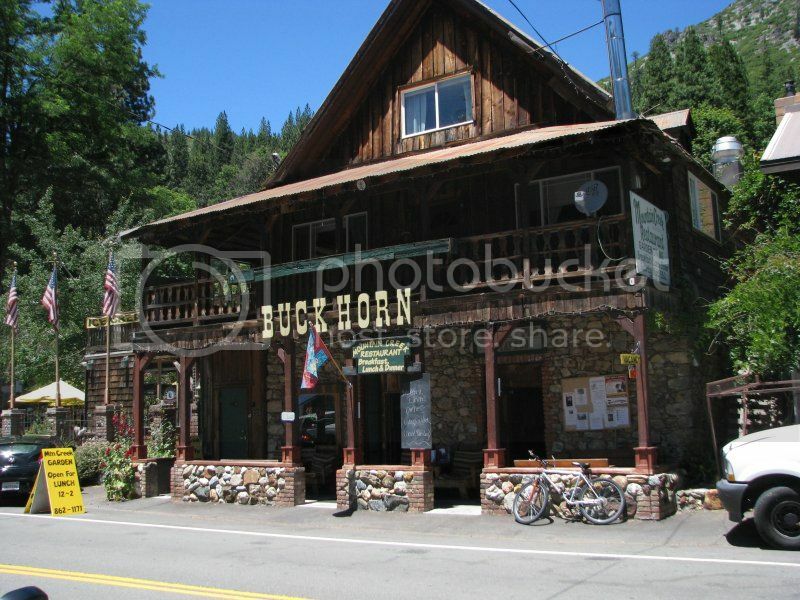 Lunch was at the Mountain Creek Restaurant in Sierra City. I enjoy the unique atmosphere of small town restaurants like that. Once rested and fed it was time to head back home. For some reason, I've ridden and driven this part of Highway 49 northbound multiple times, but never southbound. In the past I've always taken a different route back. I knew that I would need fuel, but decided to wait until the bike indicated that it was getting low, since I know I can go at least 25 miles after I see the little yellow light. That was good enough to get all the way back to Auburn. Sometimes I've felt that the big KTM was missing something on twisty roads that the previous Ducati motorcycles had. Not on this trip. It felt great riding through the canyons on Highway 49. I didn't spend much time stuck behind slower traffic, even though there aren't quite enough passing zones on that road. Sometimes things just go right and you catch the slower traffic right before a passing zone. Once to Nevada City I knew that there wouldn't be any more interesting roads until the other side of Auburn. More than half of the section between those two towns is four lane and there was quite a bit of traffic. As I usually do, I got slightly lost in Auburn trying to find where Highway 49 goes through town. I need to go up there sometime and ride that section three or four times to get more familiar with it. I filled the tank in Auburn, where it was finally starting to get hot. The temperature had been about perfect for the earlier part of the ride. Although I had opted to skip Salmon Falls Road at the start of the trip, it seemed a more desirable route heading back. It was nice to be on familiar roads headed home. The total trip was 256 miles and took around eight hours. The bike is still all dirty sitting out in my garage. Looks like I'll finally have to give in and wash the thing. 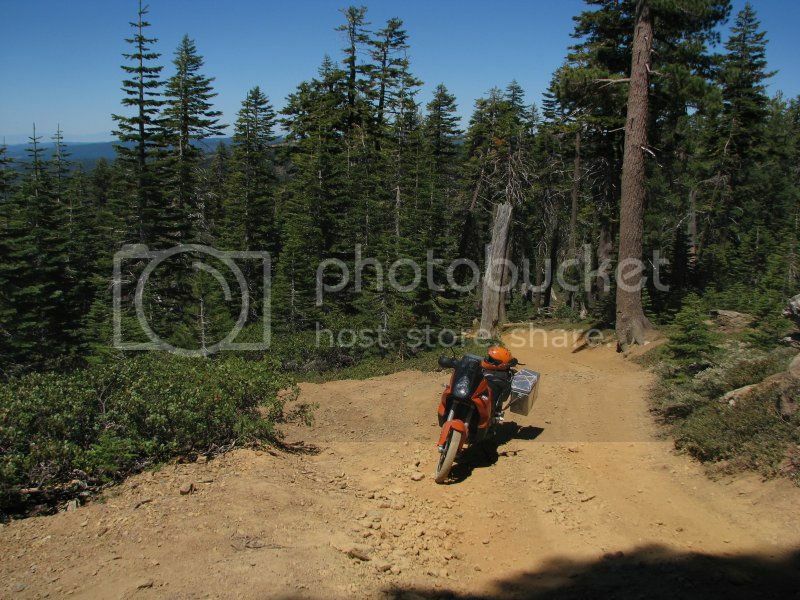 And sometime before it snows, I hope to head back to Sierra Buttes on my XR650L and make it to the top of the lookout. I'm not going to let that road beat me. Looking at trip reports like yours and talking to some friends of mine who are active in the European off-road rally scene really makes me want to get myself another bike that will go the distance off the beaten track. This page was generated in 0.37 seconds.